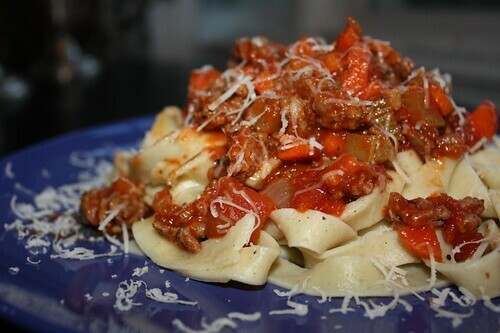 With May temperatures in the forties I was struck with a sudden urge to make bolognese. More importantly: to eat bolognese! I had most of the ingredients necessary in the freezer and fridge and was fairly certain that I could cobble together a facsimile in a pretty short time. To start I made a Caesar salad. 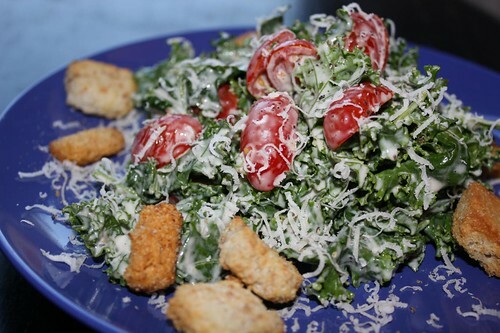 Since the health benefits of kale have been a theme for the past few months I decided to make a Caesar salad out of kale. The best thing about this nutrient-dense leafy green is that it's so healthy that you can completely cover it in a thick Caesar dressing and it completely balances out any of the unhealthy properties of the salad dressing. It's true! Look it up! I ended up rendering bacon, cooking garlic, onion, celery, carrot, and ground beef before added diced tomatoes, and tomato sauce. I used some dried basil and thyme and a bay leaf for seasoning. I served this along with some fresh fettuccine and a loaf of inappropriately defrosted Jewish rye bread. Shockingly the bread worked as an accompaniment, something I was not expecting. I didn't add any stock or cream to the sauce, something that traditionally should have been added, because it was tasty enough without. And since there wasn't any kale in the sauce to counteract it that cream would have went straight to my hips!